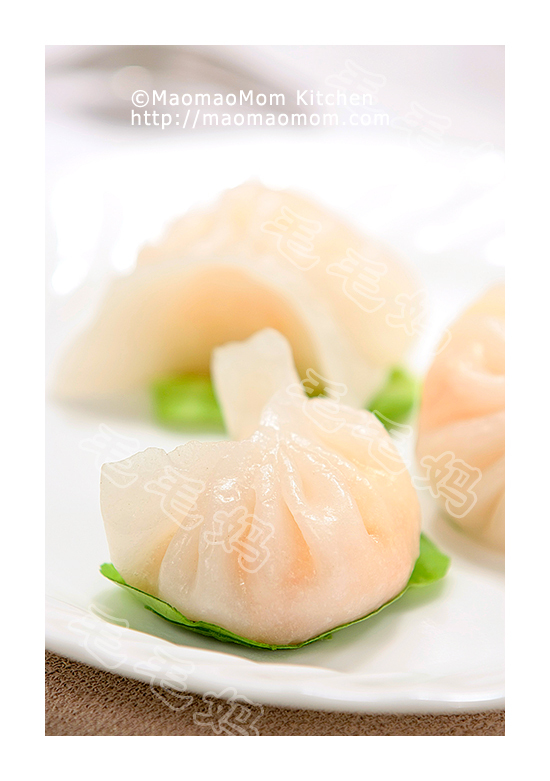 I have been busy working on my first eBook entitled “Dim Sum & Desserts” for the past few months. Very happy that it is in the final proofreading now, soon it will be released. Here is the cover for the eBook, do you like it? 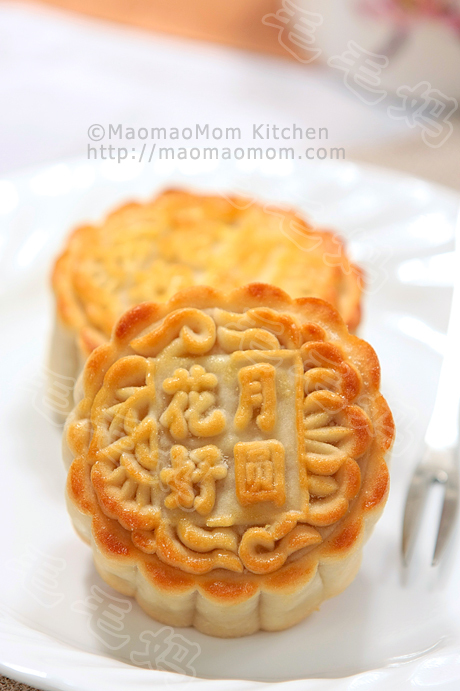 Time flies, I can’t believe that MaomaoMom.com is turning ONE pretty soon as a bilingual blog. Thank YOU all for your continuous support. I will have a giveaway of InstantPot electric pressure cooker (my favorite pressure cooker) as a small token of my appreciation, starting on this coming Sunday, June 9th at 2 PM. Please come by and join me to celebrate. When I saw this cake at jocooks.com, its name intrigued me. 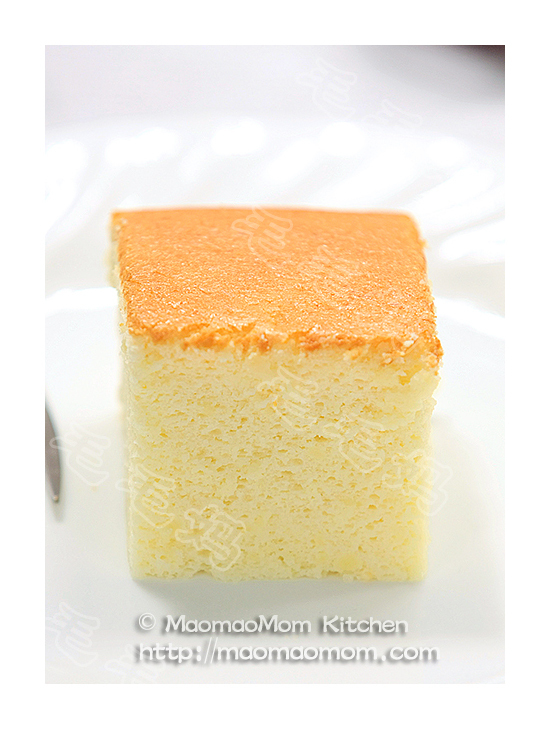 It’s amazing that only one batter turns into a three-layered cake, with a layer of custard in the middle! The trick for this cake is to make the batter very thin, similar to a crepe batter. I have modified the original recipe with less butter and sugar, and it turned out great. 7: 2 tbsp icing sugar. 1: Preheat oven at 310F/155C. Grease an 8 x 8-inch baking dish with 1 tsp butter and set aside. 2: Separate eggs into two clean and dry mixing bowls (Picture 1). Add white vinegar to egg whites and beat with a handheld mixer on high speed until soft peaks form. Then add ¼ cup sugar and beat until stiff (Picture 2). 3: Beat egg yolks and ¼ cup sugar until pale (Picture 3). Then add 1/3 cup melted butter (Picture 4) and 1 tsp vanilla extract (Picture 5). Beat at low speed until just combine. Add the flour (Picture 6) and beat at low speed until all combine. 4: Slowly add warm milk (Picture 7) and beat at low speed until well mixed (Picture 8). Add 1/3 of the beaten egg white into the yolk and flour mixture (Picture 9) and fold with a spatula until mixed. Then pour it back to the remaining 2/3 of the beaten egg whites (Picture 10). Gently fold with a spatula to mix very well (Picture 11). 5: Pour the batter into a 8 x 8-inch buttered Pyrex baking dish (Picture 12). Bake in the preheated oven at 310 F/155C for 55-60 minutes until surface turns light golden. 6: Let the cake cool then sprinkle icing sugar on top. Cut into 16 pieces before serving. This entry was posted in Dessert and tagged Cake, Dessert. Bookmark the permalink. It’s eastern time 2 pm. 毛毛妈的书是我的秘密武器。 简单，成功率特高。 现在， 不光我， 我的先生孩子也是毛毛妈的粉。只要说， 今晚上毛毛妈的新菜， 他们都很期待 。 谢谢你， 毛毛妈。 等待抽奖， 期待厨艺不断进步…. Ingredient #4, did you mean “baking powder” instead of 1tsp cake flour? Don’t you need baking powder for this one? I absolutely loved all your cakes, they are great! May I suggest a Kitchen Aid Electric Stand Mixer instead of a handheld mixer? I have been using the Artisan model for the last 5 years. It is the most useful appliance in my kitchen. No, this means that total flour is (3/4 cup + 1 tbsp)=110g. No baking powder is needed. You can absolutely use Kitchen aid electric stand mixer. what is cake and pastry flour? Do I mix cake flour and pastry flour? how to mix? it’s low protein flour, ideal for baking.